Various Delicious Food Optional : All the fresh strawberries, marshmallows, pretzels, cookies, and other food can be dipped in the chocolate fountain. 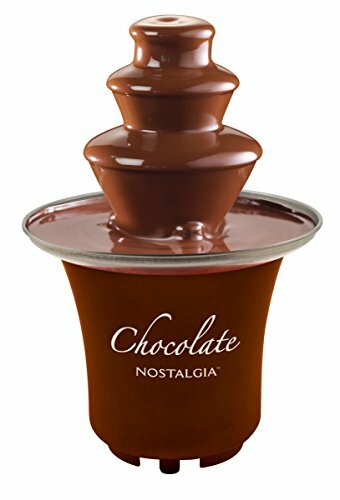 In addition, you can turn the chocolate fountain into a fountain of cheese or barbeque sauce according to your various requirements just by pouring cheese or barbeque sauce into the fountain base besides chocolate. 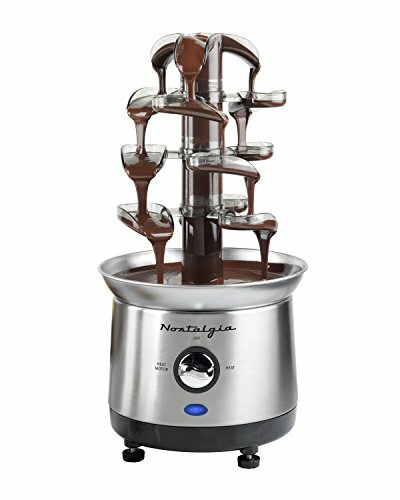 Suitable for Cafeterias and Home : The chocolate fountain is able to work continuously for almost 48 hours for one time. The chocolate waterfall is used in cafes, restaurants as well as at home. Moreover, it is also suitable for a bachelor party, wedding, ball or birthday party, creating a relaxing and pleasant atmosphere by satisfying people's need to help and enjoy themselves. 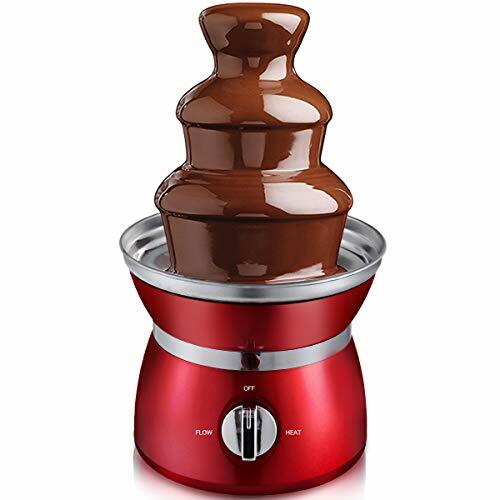 4-tier Auger-Type Tower Design : The chocolate fondue fountain is designed as a 4-tier rotating fountain tower, which keeps the chocolate cascading from one tier to another continuously. Such cascading waterfall design is available for several people to enjoy delicious chocolate dipped food together at the same time. Besides, people's appetite and joy are driven and increased. 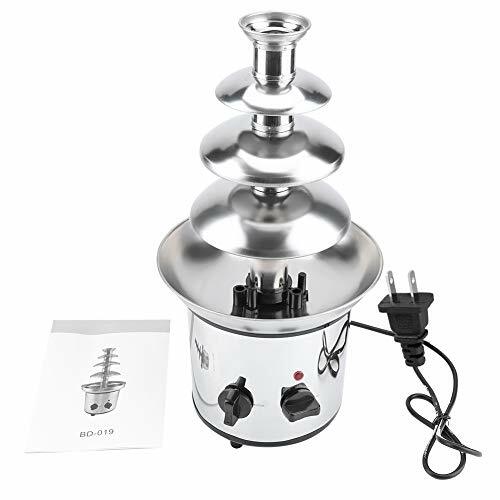 Stainless Steel and Easy To Clean : Mainly made of stainless steel, the chocolate fondue is durable and rust-resistant. Each tier of the tower, the auger-type rod and its cylinder are able to be removed easily. After using the chocolate fountain, you can get each tier and the cylinder removed first. Then remove the auger-type rod. Every part can be cleaned quickly. What better way to end a dinner party than with a combination of dessert and entertainment? 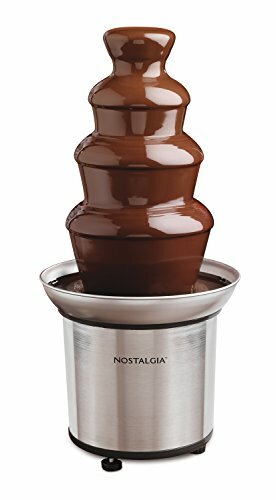 The Nostalgia CFF1000 Chocolate Fountain makes snacking fun, featuring three cascading tiers that cycle up to 32 oz. of melted chocolate continuously. The base is made from steel with a temperature control, while the fountain itself features plastic parts for easy cleaning. All you need is fondue-quality chocolate and food for dipping (chocolate and other foods are not included). They strive for innovation in small appliances and while many of their products are designed to optimize your hosting experience, safety doesn't take a back seat. All Nostalgia Electrics carry the GS and SSA electrical approvals. With Nostalgia Electrics, "Everyday's a party!" Product Guarantee: This item includes a limited 90-day manufacturer's warranty. Uses 32 oz. of chocolate or other melting sweet. Auger-style pump system. 3 cascading tiers. Hand-wash only. Dimensions: 8.46L x 8.46W x 17.13H in..
Dimensions: 8.46L x 8.46W x 17.13H in. 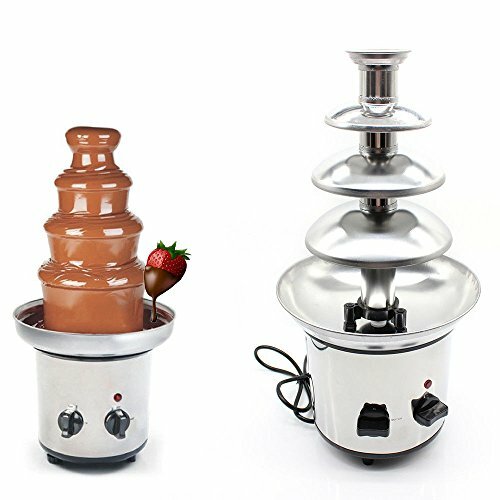 This Mini Chocolate Fondue Fountain can be the ultimate accessory for special occasions. Fountain features a tiered plastic tower with a black plastic base. It works as good as it looks, carrying melted white, milk or dark chocolate from the base to the top of its tower. Give any event the feeling of a "catered affair" by providing your guests fresh strawberries, marshmallows, pretzels and other goodies to dip in the flowing chocolate. Dip to your heart's delight. From its rich aroma to its smooth taste and texture, nothing is more pleasing to the senses than melted chocolate. And when it's cascading like silk between the tiers of this table top fountain at your next dinner party? Well, there's no guest on earth who'll be able to resist. Retro Chocolate Fountain A Sweet Centerpiece. 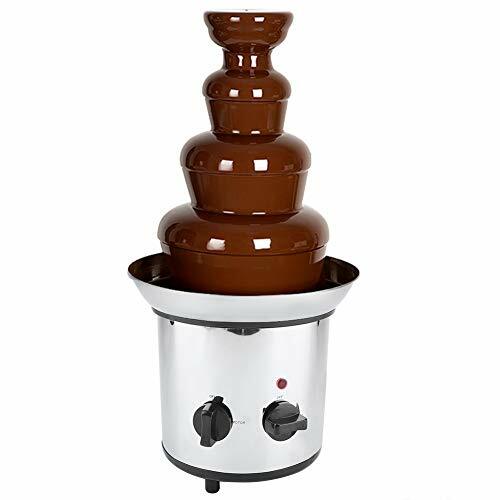 Along with a selection of marshmallows, strawberries, mini-doughnuts and other dip-sized delights, this chocolate fountain can take center stage at any party, stunning guests with an indulgent fondue experience they'll never forget. Simple Setup. It's easy to create a decadent chocolate display. Once you've assembled the fountain, switch it on. While it's heating up, separately warm up your favorite chocolate and pour it in once the fountain is ready. Easy To Clean. 2-tier design. Creates an extravagant melted chocolate display. 1.5lb capacity. Circulates plenty of chocolate for everyone. Dial operation. 3 simple settings for easy use. 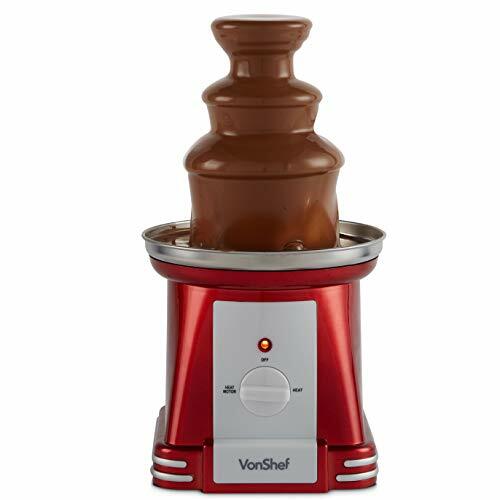 This is our Giantex brand new and high quality chocolate fountain. It's easy to assemble. Safety stainless steel has stable property and would not rust easily. And it's easy to clean, the chocolate would not stick on it hardly, water and wipe could clean it easily. 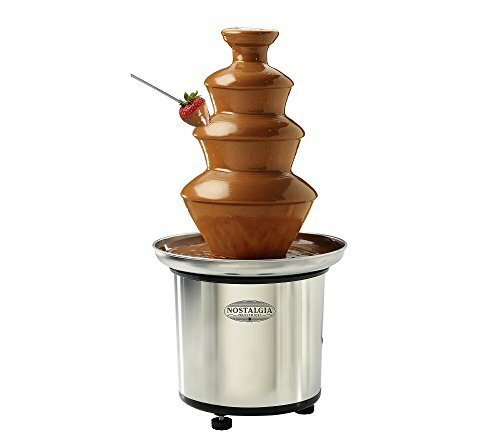 Auger-style fountain could supply the continuous flow of chocolate. Once it starts working, you could enjoy your party, wedding or ceremony time and do not need to worry about the pause of it. It's your good partner of party, do not hesitate to buy it! One Switch Heat Function The usage method of this item is convenient. One adjustable switch on the below part can be used to heat the machine and auger part. It can let you enjoy the hot melted chocolate in home or office. Auger-style Fountain Auger-style fountain can supply the continuous flow of chocolate. Once it starts working, you can enjoy your party, wedding or ceremony time and do not need to worry about the pause of it. 3-Tier Simple Assemble This product has straight forward illustrations and descriptions. The 3-tier fountain is easy to understand the assemble progress. It won't take you much time and could save your energy. Stainless and Easy Clean The material of this item is stainless steel which has stable property and would not rust easily. And it's easy to clean, the chocolate would not stick on it hardly, water and wipe could clean it easily. 100% Satisfaction Guaranteed We would try our best to give you satisfied shopping experience, if there is quality, we would make best solution to solve the problem. 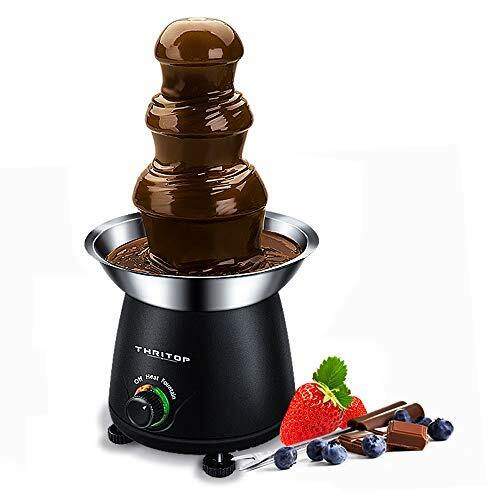 Your party guests will love being able to dip their own desserts with our THRITOP Chocolate Fountain. Discover a fun way to serve dessert at wedding showers and receptions, holiday parties, and more! 2.Drip edge helps to protect against spills. 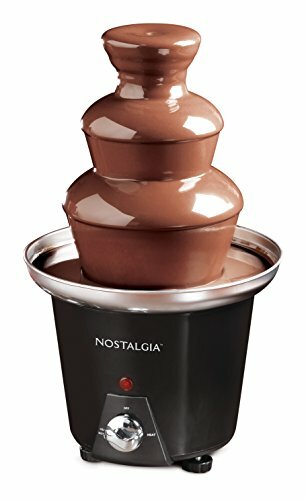 Ultra-quick Chocolate fountain can be formed within 1 minute. PTC heating element to aviod solidifying. Removable and detachable parts for easy cleaning. 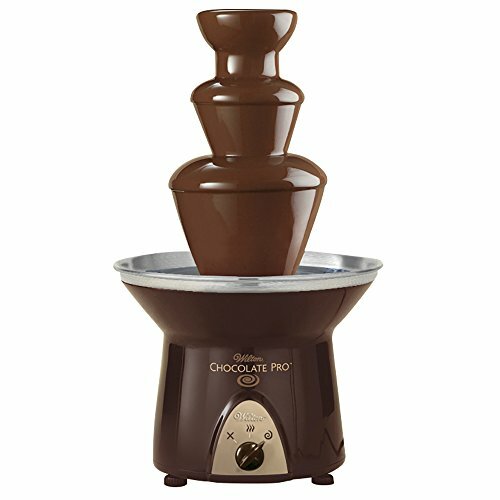 3.11(27.94cm)chocolate fountain. Adjustable durable plastic feet with bubble level to keep the fountain steady. 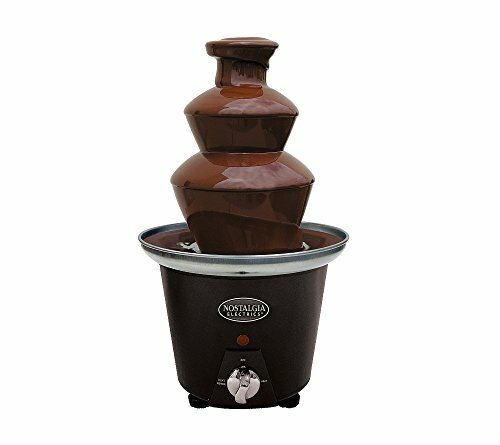 This 4-tier chocolate fountain makes for a beautiful cascade of chocolate, large fountain holds up to 6.6 lb. of chocolate, perfect for big parties and celebrations.The usage method of this item is convenient. One adjustable switch on the below part can be used to heat the machine and auger part. It can let you enjoy the hot melted chocolate in home or office. All finishes are non-toxic, safe and Eco-friendly. 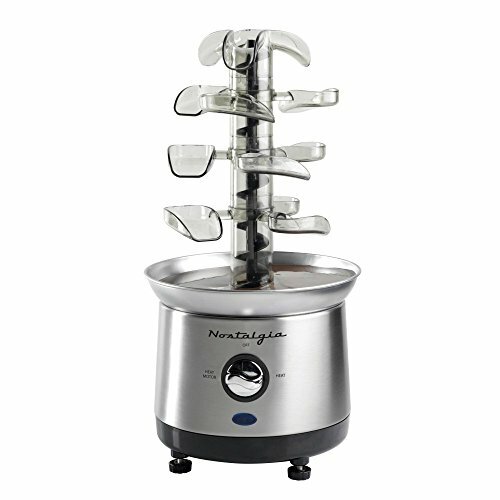 Fast melt chocolate, adjustable stanza temperature, heat stability. Easy to clean , operate and use. Unique bowl design keeps chocolate melted and flowing while three canopies are perfectly spaced for easy dipping. Perfect for family gatherings, birthday parties, wedding and baby showers. Truly adds an element of fun, a delicious food experience and the enticing aroma of chocolate! 4-Tier tower of chocolate fountain creates a beautiful cascading effect, inviting you to dive in and enjoy the chocolate-covered bliss. HIGH QUALITY MATERIAL --Stainless steel base and tower ideal for fruit, marshmallows, cookies, pretzels.The material has stable property and would not rust easily. And it's easy to clean, the chocolate would not stick on it hardly, water and wipe could clean it easily. OCCASION --The chocolate waterfall is used in cafes, restaurants as well as at home. Moreover, it is also suitable for a bachelor party, wedding, ball or birthday party, creating a relaxing and pleasant atmosphere by satisfying people's need to help and enjoy themselves. APPLICATION --Favorites include everything from Chocolate Fondue, Caramel Fondue, Cheese Fondue, Salted Caramel Fondue, Barbeque Sauce and Ranch Dressing for dipping veggies. 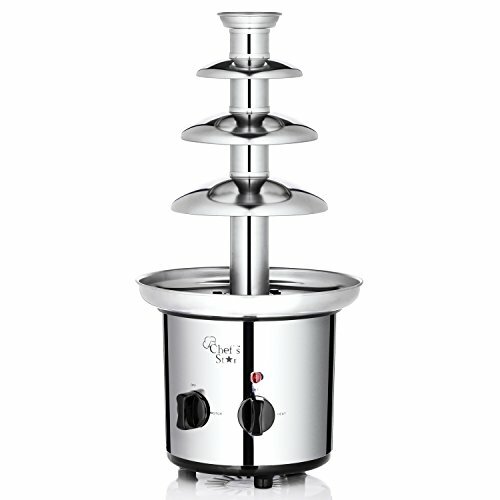 Your fondue choices are endless with the Classic Fondue Fountain. GOOD DESIGN --This product has straight forward illustrations and descriptions. The 4-tier fountain is easy to understand the assemble progress. It won't take you much time and could save your energy. 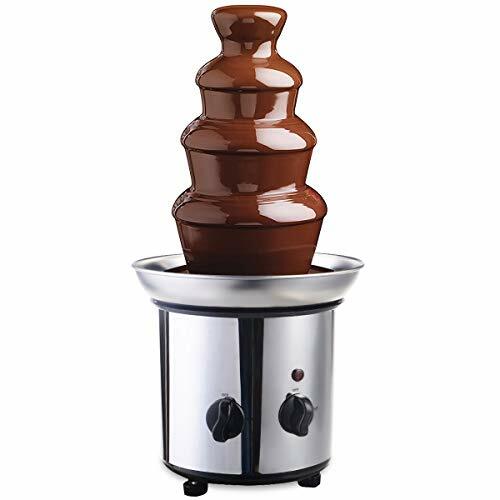 KANING's 4 Tiers Chocolate Fountain product quality is guaranteed,If you have any questions, feel free to contact us. Warranty: 90-day limited parts and labor.